The LG G5 is one of the hot and trending flagships in the market that comes with several attractive features. People want to own the flagship because of its unique design and high performance. If you are a lucky owner of an LG G5 Smartphone and want to use it for various purposes, then you can buy some LG G5 Accessories. You can make your device more functional and user-friendly with the help of these G5 Accessories. You can stay connected with the online world, turn your device like TV, Music Player or Gaming Device. Well, in this post, we are going to share some best and must have LG G5 Accessories. You will find some Official LG G5 Accessories in this list from the LG. So, let’s have a look our recommended LG G5 Accessories list and get your wished one now. Some people don’t like to hide the original design of theirs Smartphone, so they like to use a transparent case for their phone. The J&D LG G5 Bumper Case comes with the stylish and attractive design. The slim case will protect your device from a drop or hit damage without adding extra bulk. The precious cutouts ensure easy access to the headphone port, mic, button, camera, and sensor. As the case comes with the anti-slip feature, so you can comfortably operate your smartphone with one hand. The bumper case available in 6 different colors, so gets the case with your favorite color. The Spigen is a well-known and popular mobile accessories manufacturer. 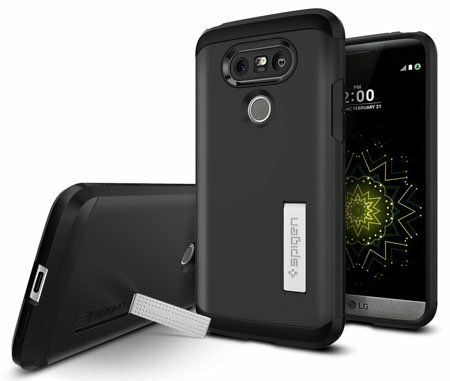 They come with a dual layer case for the LG G5 with Kick Stand and some other features. The slim and lightweight case will protect your phone from scratch, drop or dump damage. The advanced air cushion technology helps to protect from small drop damage. The dual layer case keeps your phone safe without adding extra bulk. The kickstand is perfect to operate the flagship on the ground. Looking for a premium quality and expensive case for your G5? 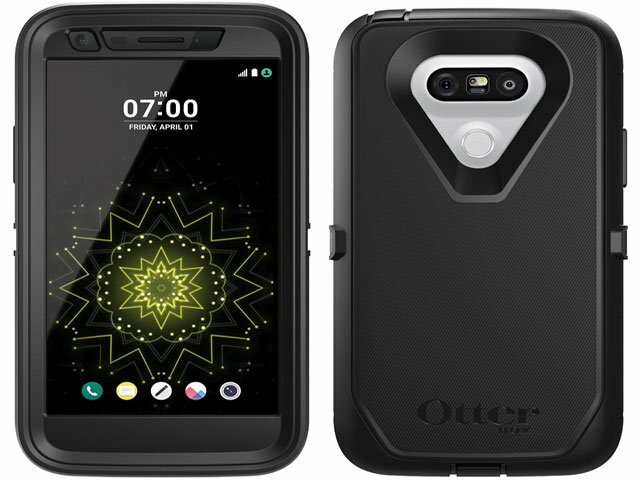 Then the OtterBox DEFENDER SERIES Case for LG G5 is the perfect one for you. 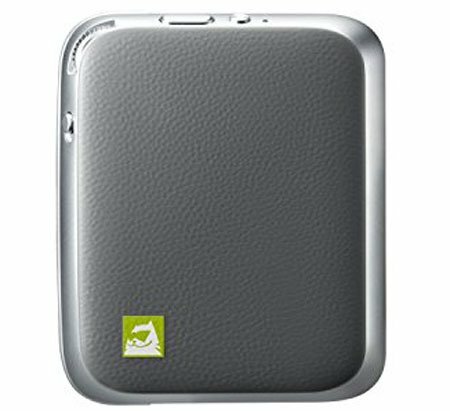 The case comes with high protection against scratch, hit, drop or dump damage. 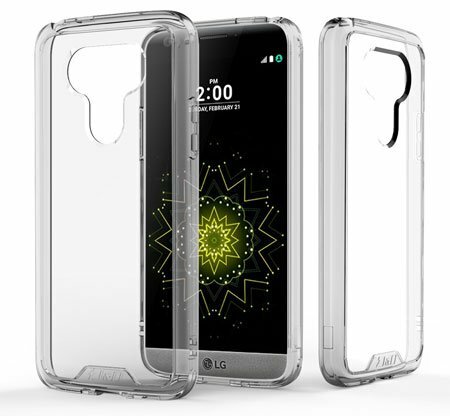 The case comes with a built-in screen protector, so you don’t need to buy an extra screen protector for your LG G5. The case is available in 3 different colors with the 1-year warranty. If you love to use a leather cover to keep your flagship safe, then the Arae Flip Folio Leather Wallet Cover is the ideal one. 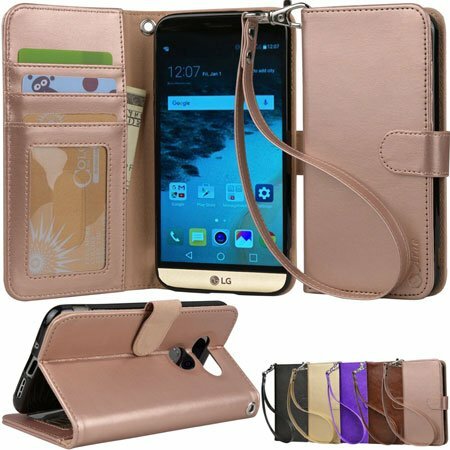 This is a wallet style leather cover for LG G5, so you can also keep your ID card, Credit card, and money in the cover case. The case made of 100% original leather materials and available in 5 different colors. There is also a waist strap and kickstand available on the cover. 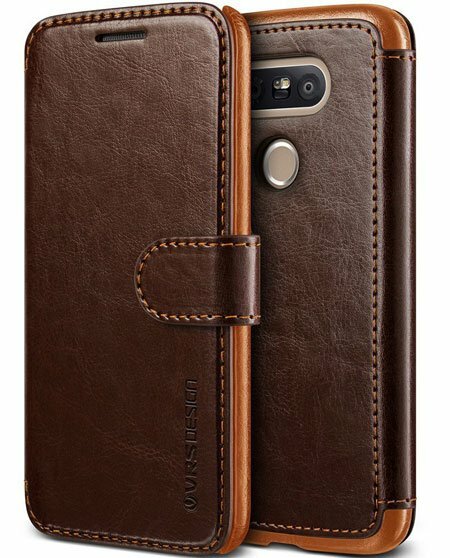 Looking for a luxurious leather cover for your LG G5? Well, the LG G5 Cover by VRS Design is here with three different colors and premium quality leather. Like the other leather cover, this cover also comes with ID card and credit card holder. The cover will protect your device against drop or hit damage. 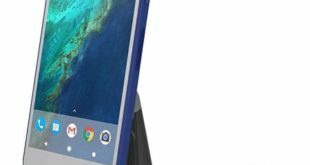 It will cover all corners of this smartphone. The TPU lip on the edges will keep your phone screen scratch free from the ground. We always need to recharge our smartphone battery while we are on the move. So we need a car charger that helps to recharge the smartphone battery easily and quickly. 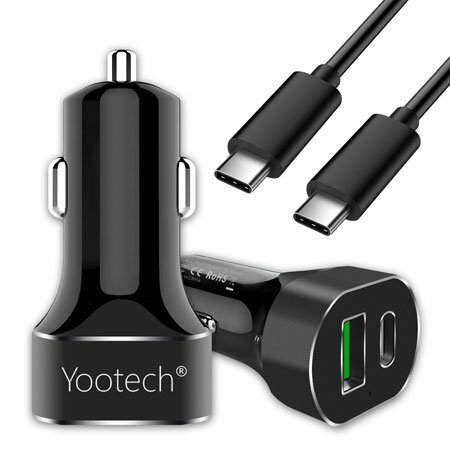 The Yootech comes with a Type C car charger for LG G5. The charger is available in two different versions with 30W and 42W output. The 30W version comes with a Type C USB port and a Normal USB2 port. And the 42 version comes with one Type C USB Port and Two USB2 Port. The advanced protection system will protect your device from overcharging, over hit or short-circuit. 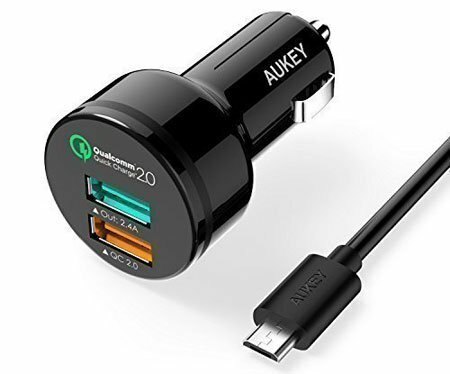 The AUKEY Dual-Port Car Charger is one of the best-selling and top rated car charger at Amazon that is also perfect to recharge iPhone, Samsung, HTC, Nexus and all LG devices. This charger can recharge your device battery 75% faster than the traditional car charger without damage the battery. This car charger also comes with built-in safeguard protection feature. This will keep your device safe from overheating, overcharging or short-circuit. 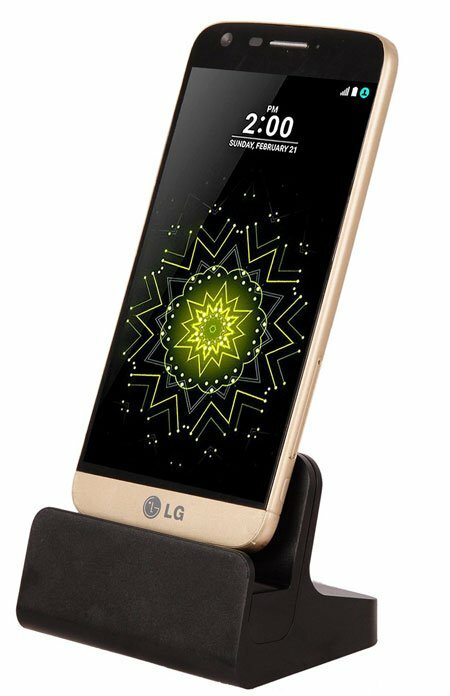 The LG G5 Desktop Charging Dock is an awesome charger for LG G5 that is perfect to use on a desk. The Type C port ensures fast and secure charging of your device. The charging dock compatible with any size case. There is an adjustable height system available in the dock to ensure the perfect fit. A 1-year warranty is available with this charging dock. Sometimes we need an extra wall charger during travel time. 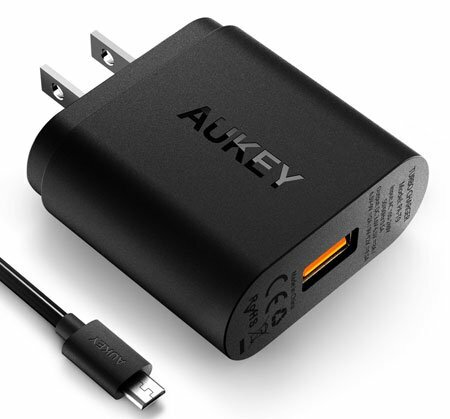 So, if you are a traveler, then you can buy the AUKEY USB Wall Charger for G5. The wall charger comes with a micro USB cable that is perfect to recharge any Android smartphone or tablet. The wall charger can recharge your device four times faster than any other traditional wall charger. The multiple built-in safeguards protect your device from overheat or short circuit. 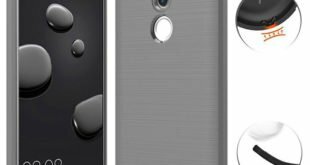 Want to protect your LG G5 screen from light drop, scratch, dirt and dust? Use the LG G5 Screen Protector by Spigen that comes with crystal clear and high touch sensitivity feature. The screen protector is available in 3 packs at a reasonable price. You can easily install it on your device screen. Spigen offer lifetime warranty for this screen protector. Another LG G5 Screen protector that comes with single pack and manufactured by the IQ Shield. This is a high durability, touch sensible and non-yellowing screen protector for the G5. Like other screen protectors, you can also install this one on your device quickly without any hassle. Love to listen music while moving, hiking or driving? Well, turn your LG G5 as a music player with the help of LG Electronics Tone Pro HBS-750 Bluetooth Wireless Stereo Headset. The Bluetooth Headphone comes with several attractive features and available in 6 different colors. Longer battery life, high-quality sound, and lightweight make this headphone perfect to carry anywhere. Want a larger size wireless headphone with high quality sound, long battery life and stylish design? 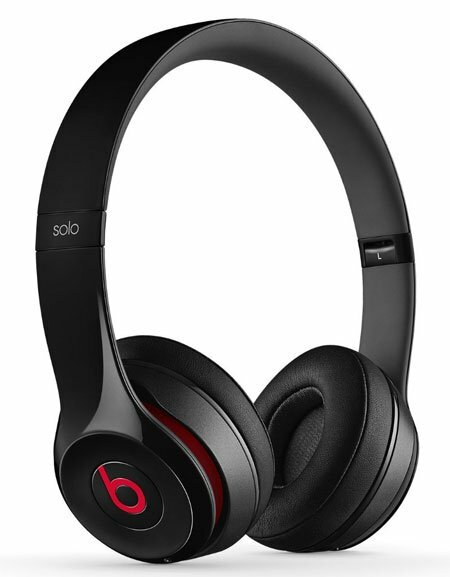 The Beats Solo2 Wireless On-Ear Headphones is here that you can connect to any Bluetooth device. You can enjoy music up to 12 hours for a single charge. 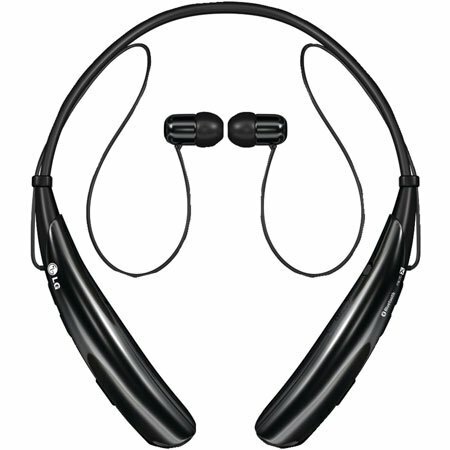 There is also a built-in mic available in the headphone to receive calls. The PHL 2 X USB-C to Micro USB Adapter is an essential accessory for those LG G5 owners who want to connect his/her G5 with Micro USB cable to recharge or transfer data. 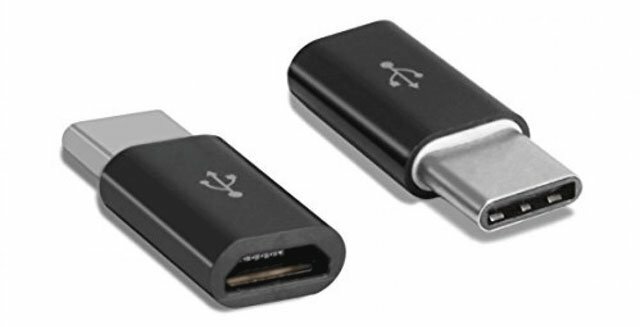 The simple and effective USB adapter manufactured according to the Type C USB Standards. 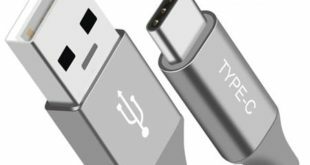 The adapter is also compatible with all Type C USB devices. The LG G5 Friends Cam Plus is an official LG G5 Accessories to make your G5 more functional. The add-on comes with the real camera with a physical key. There is additional 1140 mAh battery capacity that will extend your device battery life. There is also a shutter button, zoom dial and hand grip available in this add-on. Needs an armband to protect your device during hiking, running or when at the beach? 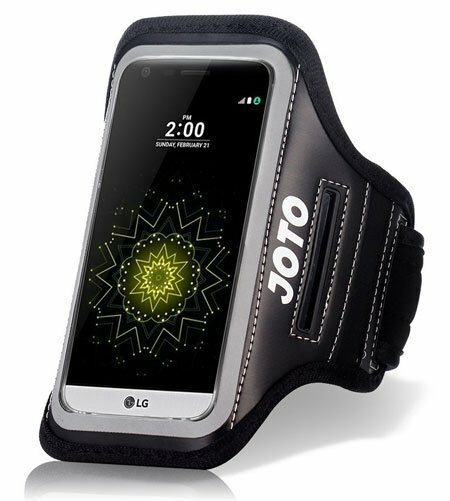 The LG G5 Armband Case by JOTO is here with several features. The premium quality and durable armband come with a built-in key holder, ID card holder and a headphone layout. The crystal clear screen comes with high touch sensitivity, so you can access your G5 while running or on the water. The adjustable size makes this armband perfect to fit on the different size arm. Don’t like to carry a power bank or a charger while moving for a long day? The LG Spare Extra Standard Replacement Battery BL-42D1F is here to solve your problem. The battery comes with 2800mAh capacity that will help to connect with the online world for a whole day. 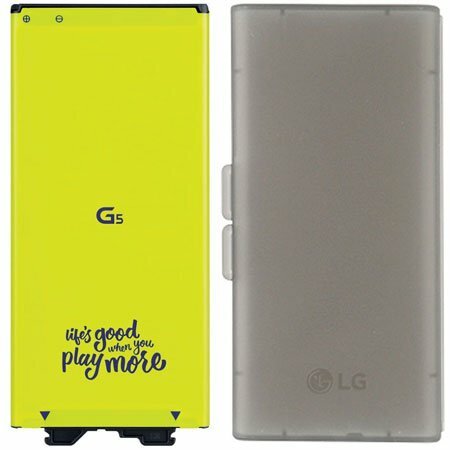 The battery is only compatible with the LG G5. Like photography? Like to capture awesome moments? Want to turn your LG G5 as a professional photography camera? 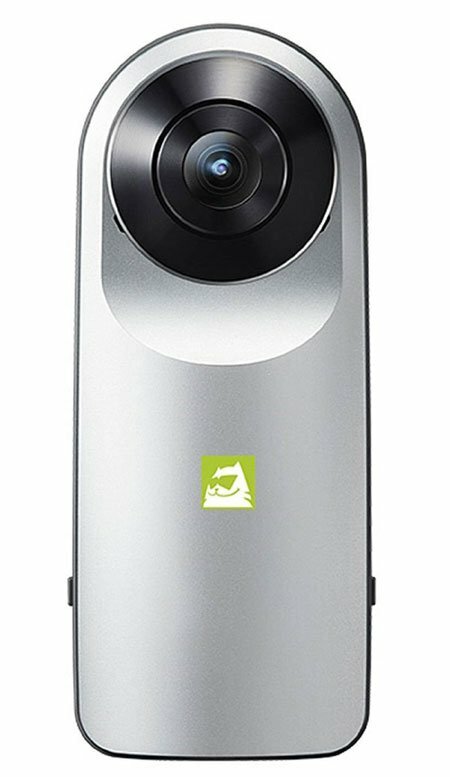 The LG G5 Friends 360 CAM LG-R105 is here with 13 million pixel lenses. The dual wide angle camera support 2K video and 5.1ch Audio recording. A car mount holder is essential and important accessory for those LG G5 user who need to access his device while driving. And the Bestrix Universal CD Slot LG G5 Car Mount Holder could be the best option that is perfect for easy mounting and navigation. 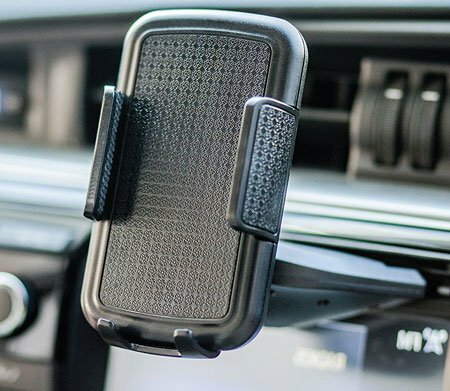 This universal car mount holder is ideal for up to 6-inch screen devices, and you can use your G5 with or without a case. The most beautiful CD mount features help to attach it without the screw. And you can remove it anytime when need. The mount is compatible with more than 50 different smartphones including LG G5, G6, G4, etc. The G5 comes with 32GB internal storage memory that might not sufficient for most of the user to save their essential documents, images or videos. So an external Micro SD card also essential for them. 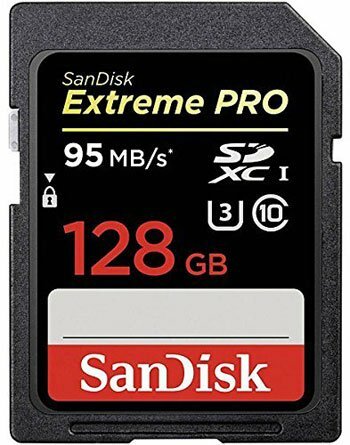 And the SanDisk Extreme PRO 128GB is the best option with up to 95MB data transfer speed. The SD card can capture 4K Video and come with water, temperature, shock as well as x-ray proof features. So, these are our recommended LG G5 Accessories. Hope you will find this list helpful and all of your desirable G5 accessories here. Let us know by commenting below which are your favorite G5 accessories. You can also suggest us to include some must-have accessories on this list if we missed. Cases and covers are used for protection reasons, but I do not prefer them much as they change the look of my phone. I prefer to use the phone as it is. You are right, Case and covers change the look of phone/tablet. But You can use transparent bumper case to protect your smartphone from slip or light drop damage. Transparent case won’t hide your smartphone look. The leather wallet cover has made the charger a great device to look at. This article is very informative.